Because of the rise of the internet and the growing popularity of downloadable content, public libraries are evolving at a pace never before seen. Harris County Public Library has never shied away from new technologies--we see them as opportunities to enhance existing library services and to expand into new service areas. But like all organizations that want to thrive in a changing technological landscape, we must continually reassess our mission and our goals. To help us do that, and ultimately allow us to provide better service to our customers, HCPL invites those of you who check out ebooks to complete a brief survey designed by a nationally-respected research firm. Digital Media Catalog Now Available to Kindle Users! 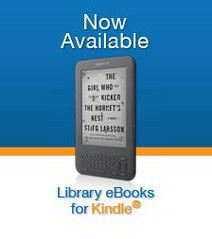 Kindle is here! As of this morning, you can now checkout and download 5400 of our eBooks to the Kindle!